When the Lord provides the financial and time opportunities, we are blessed to travel to our brethren in various parts of the world. We come as workers who must squeeze as much practical training and evangelistic work into a short period of time as possible. A typical day would begin around 6am. After Bible study and prayer, we would meet for breakfast and discuss the day's activities. Our hosts in Africa has been very easy on us recently (less travel), allowing us to communicate with the local pastors more on a one to one basis, praying, encouraging, and counseling them in their ministries. Sometimes we must leave earlier for destinations through the beautiful woodlands of Africa in order to be ready to preach at noon, but most definitely for evening programs. 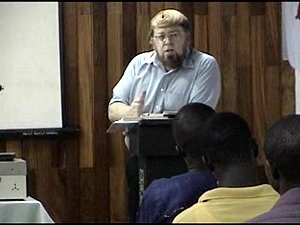 We work with very competant, national Christians--dedicated men who organize the seminars and handle almost every detail themselves. All we have to do is show up and work on a few minor details before sharing the Word of God with hundreds of pastors and evangelists. The seminars which are held in Ghana often have a more international flavor to them, with a recent seminar being translated into four different languages simultaneously, and having representatives from seven countries. Blueprint For Revival provides the auditorium space, meals, water, humble housing facilities, hours of teaching from God's Word, and usually some printed materials for them to bring home with them to study further. The fellowship has been spectacular, and we have seen these seminars grow from around four hundred to over a thousand. 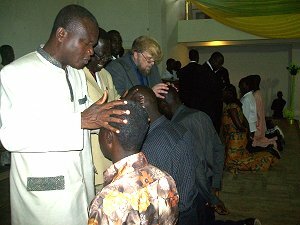 On the most recent trip to Ghana, Blueprint For Revival Ministries ordained over 150 men into the Gospel ministry--one of the largest ordination services ever conducted in West Africa.